Consider this scenario; you spend a week preparing to send out an email campaign. You take care that your content is relevant, you share a whitepaper to add value, you add CTAs strategically to promote your offer and create compelling subject lines to do an A/B test. When the D-Day arrives you excitedly roll out your campaign keeping your fingers crossed for good results. What happens next is a dismal affair. You see more than 40% of your emails in the junk folder. After all your efforts, majority of your emails were not even delivered! On investigating you find out that most of your email addresses on your list either do not exist or are not updated. So, what went wrong? The one and most important thing you forgot to check is the quality of your database. When was the last time you cleansed your database? Taking the above stats into consideration, Email Verification and Validation is important in keeping your database updated and relevant. When you continue to send emails to invalid addresses, your bounce rates increase and your reputation is negatively affected. This will eventually lead you to getting a ‘bad sender reputation’ and your emails will be blocked. 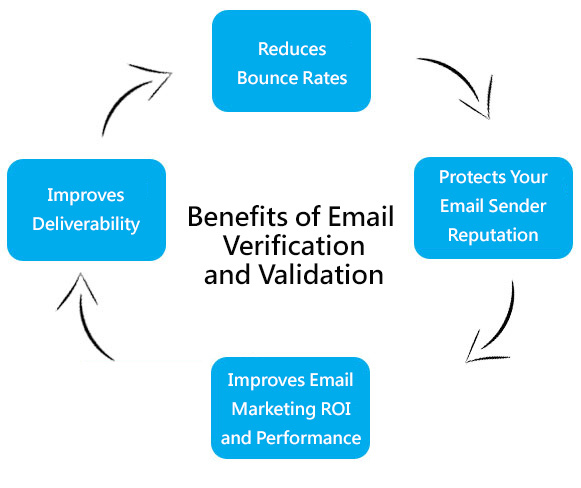 With more than 150 email verification and validation experts, we verify the most complex of databases making your data the most effective in the industry. We ensure to correct typos, syntax, domain and other errors to improve deliverability and reduce bounce rates. We eliminate all existing duplicates and delete inactive records in your database to protect your email sender reputation and improve email marketing ROI.